In this tutorial we will learn about how Input and Output is handled in a computer system. The I/O subsystem of a computer provides an efficient mode of communication between the central system and the outside environment. It handles all the input-output operations of the computer system. Input or output devices that are connected to computer are called peripheral devices. These devices are designed to read information into or out of the memory unit upon command from the CPU and are considered to be the part of computer system. These devices are also called peripherals. For example: Keyboards, display units and printers are common peripheral devices. Input peripherals : Allows user input, from the outside world to the computer. Example: Keyboard, Mouse etc. Input-Output peripherals: Allows both input(from outised world to computer) as well as, output(from computer to the outside world). Example: Touch screen etc. Interface is a shared boundary btween two separate components of the computer system which can be used to attach two or more components to the system for communication purposes. Peripherals connected to a computer need special communication links for interfacing with CPU. In computer system, there are special hardware components between the CPU and peripherals to control or manage the input-output transfers. These components are called input-output interface units because they provide communication links between processor bus and peripherals. They provide a method for transferring information between internal system and input-output devices. Programmed I/O instructions are the result of I/O instructions written in computer program. Each data item transfer is initiated by the instruction in the program. Usually the program controls data transfer to and from CPU and peripheral. Transferring data under programmed I/O requires constant monitoring of the peripherals by the CPU. In the programmed I/O method the CPU stays in the program loop until the I/O unit indicates that it is ready for data transfer. This is time consuming process because it keeps the processor busy needlessly. This problem can be overcome by using interrupt initiated I/O. In this when the interface determines that the peripheral is ready for data transfer, it generates an interrupt. After receiving the interrupt signal, the CPU stops the task which it is processing and service the I/O transfer and then returns back to its previous processing task. Removing the CPU from the path and letting the peripheral device manage the memory buses directly would improve the speed of transfer. This technique is known as DMA. 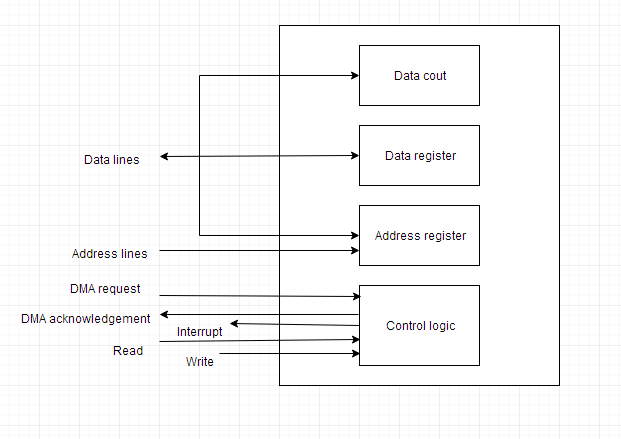 In this, the interface transfer data to and from the memory through memory bus. A DMA controller manages to transfer data between peripherals and memory unit. Many hardware systems use DMA such as disk drive controllers, graphic cards, network cards and sound cards etc. It is also used for intra chip data transfer in multicore processors. In DMA, CPU would initiate the transfer, do other operations while the transfer is in progress and receive an interrupt from the DMA controller when the transfer has been completed.